Quinns: Ha, you’ve figured it out, haven’t you? Yes, I believe that Neon Gods is nothing less than the mutant child of early Plaid Hat classic City of Remnants, a game we were delighted by all the way back in 2013. Paul: Good crumpets, you might just be right. Look, there’s even a familiar icon used to represent police officers! 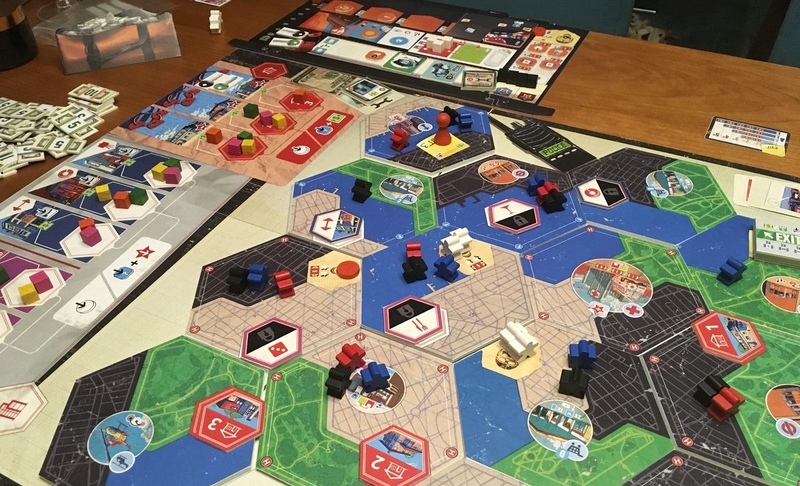 In a comment thread on this article, a member of Plaid Hat acknowledges that “Neon Gods grew out of a desire to build a reimplementation of City of Remnants,” and browsing the rulebook certainly brings back memories. Neon Gods looks a little more distilled and, well, sillier to boot, plus it offers several different scenarios to try. I’d be interested to see if this feels like a pleasant re-implementation or something slightly too familiar. We’ll let you know once we get our cardboard-hungry hands on it. Quinns: Ooh, I’m eager. While we thought City of Remnants was great, it wasn’t a game that sold very well. 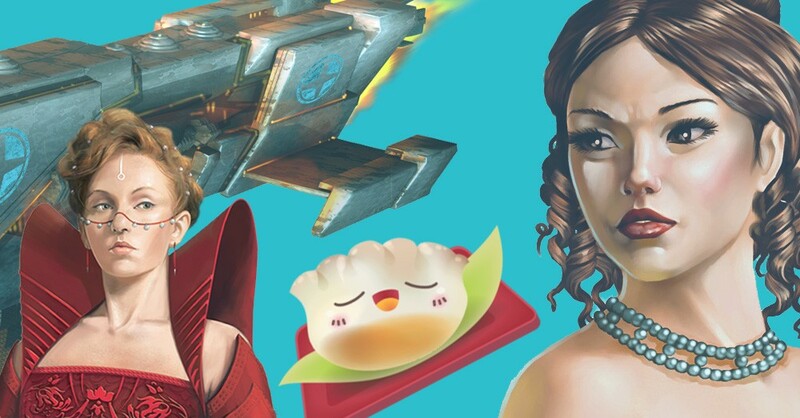 In fact, for years I’ve been referencing our City of Remnants review as the most painful example of a SU&SD review that failed to help a great game. In the meantime… Paul, would you like to play a game about managing oil pipelines? Paul: Uh, no. And yet… weirdly, yes…? 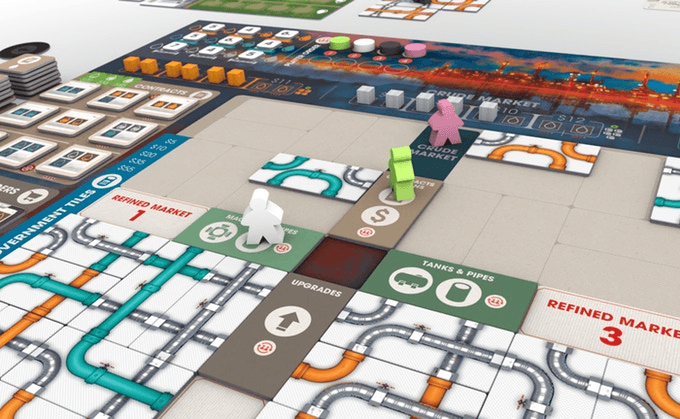 Quinns: Revealed in this cheeky tweet from Capstone Games, Pipeline is a game about just that, looking like a curious mix of tile-laying, to connect pipes, and resource management. Capstone Games have published some really strong games in the last few years, like Lignum and The Climbers, but this is actually their first internally-developed title. Paul: Living in British Columbia for several years, I have mixed feelings about pipelines, especially as in Canada they tend to be built across native land without proper consent or compensation, but I think I can enjoy them in the abstract on my tabletop, not least because some demented part of my brain suddenly wants to LINK LOTS OF PIPES TOGETHER. This looks like resource management plus puzzle and some part of my mind, perhaps the part that loves Galaxy Trucker, also wants this. The next Ian O’Toole / Vital Lacerda collaboration, Escape Plan, went live this week on Kickstarter. We got a brief look at this game of fleeing the cops in the Games News ages back and now it’s a reality, not least because the Kickstarter was funded mere minutes after going live. You might remember this pair working together on The Gallerist, Vinhos Deluxe and the infamous Lisboa. 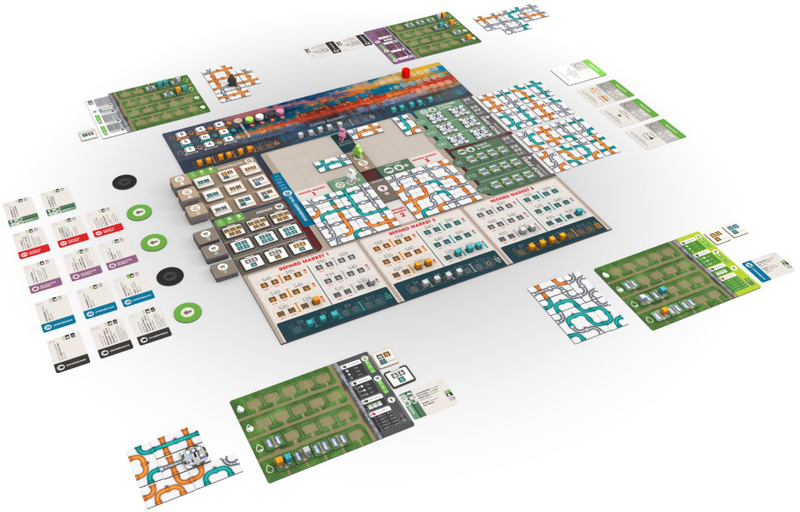 Well, in what will be good news for most of you, Escape Plan is a significantly simpler game than any of those monsterpieces. Paul: This is absolutely something I have to try when it comes out. The concept alone is fantastic and, while I didn’t get along much with Lisboa, I did enjoy The Gallerist and I think, when these two combine their powers, there’s no doubt that what they create is interesting. Quinns: Yes. Both of them seem to like games that are beautiful but almost too busy. I think they’re both good and bad for each other in equal measure, but the only thing I’m sure about is that I want them to keep making games together. Paul: AND I’ll tell you what else has interested (and surprised!) me recently. 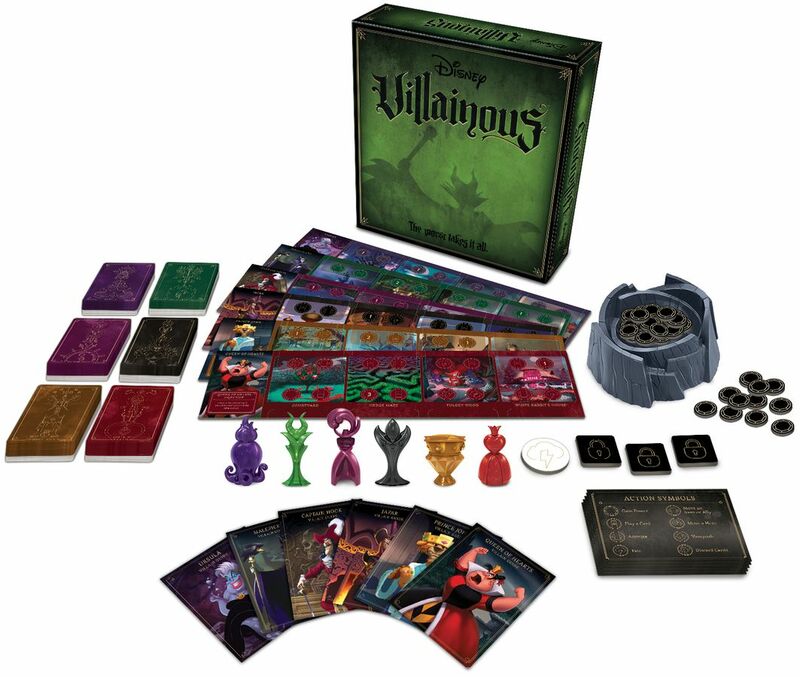 Did you spot the news about Villainous, a board game all about Disney villains? Not only did this tickle my pickle because it was about playing a villain, and because it made me wonder if Disney may dive deeper into more curious tabletop projects, but also because the design does look interesting and unique. Each Disney villain, whether they’re Jafar or Ursula or Prince John, has their own unique set of powers contained within a deck of cards, which they play in their own distinct province, and also has a distinct set of victory conditions. I don’t know about you, Quinns, but that sounds DISTINCT to me. And I know you like asymmetric games. Could this be a good example of this? Quinns: It could be! Or it could play like some nightmarish Disney Fluxx. All I know is that those symbolic miniatures are stunning. With Azul winning the Spiel des Jahres award this morning – the biggest prize in board gaming – I wonder if 2019 will become the year of abstract plastics? Paul: Much as I’m weirdly curious about pipin’ my oil about the place, I also have a strange desire to see if I can avoid dysentery in The Oregon Trail: Journey to Willamette Valley. Based upon a certain video game that is all too well-known to a particular generation of North American players (and maybe a few of us in Europe, too), the challenge is to journey west without dying of illness, being killed by wolves, being killed by bears, being killed by buffalo, being killed by starvation, being killed by snakes or being killed by drowning. Goodness, there must’ve been something very appealing about heading west in the early 1800s, because it mostly seems like a recipe for disaster, a recipe whose every ingredient was poisonous. 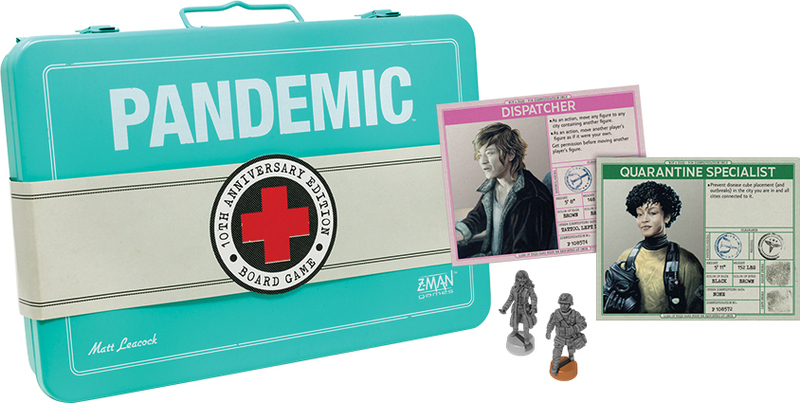 Quinns: The last game announcement we’re looking at this week is this very shiny 10th Anniversary Edition of Pandemic. Paul! Do you want a metal, beautified Pandemic? Paul: No! But I’m sure someone out there does. This is a very pretty special edition of a very successful game. Look at all those figures, at those classy cards, at that excellent case. If you want the prettiest version of Pandemic yet, and feel like spoiling yourself to the tune of a hundred dollars, this is absolutely for you. Quinns: Ooh, I tell you what this’d be great for! It’ll be a fabulous Christmas present for a loved one who’s interested in board games, but hasn’t yet taken the plunge. And finally, as we shuffle our papers, turn one last time to the camera and prepare for the credits to roll, we make a quick nod toward news that a buyer has appeared for Asmodee. The investment firm that created the board gaming conglomerate in the last few years has put their multifaceted monster up for sale, and Pai Partners, a French private equity fund, has pulled them off the shelf and taken them to the cash register for €1.2 billion. It also looks like PAI want Asmodee to keep being Asmodee for now, stating that they want to “support the current management team in its plans to grow the business further through international expansion both organically and by acquisition.” The deal is still being hammered out, but it looks like Asmodee may have a new owner soon. Does this mean more change ahead, more investment in the company or, perhaps to us consumers, no visible differences on the outside at all? I guess we’ll see. Quinns: I’m trying to glean anything informative from all of these press releases. All I can find is that Asmodee is now owned by the same investment scheme that includes a company called “United Biscuits” and another called “Roompot”. I’m going to look into United Biscuits a little more.. Oh, wow. Shut Up & Sit Down can confirm that PAI now control global distribution of both niche board games games and Jaffa Cakes. That’s too much power for any one entity, surely. Paul: I honestly can’t tell if any of this is a joke or not. Quinns: It’s not. Paul, the prospect of SU&SD selling out and becoming corrupt just got a lot more delicious.